On behalf of other Eating Disorder organizations, activists and campaigners I invite you to take part in World Eating Disorder Action Day. The first World Eating Disorder Day will take place on 2nd June 2016. 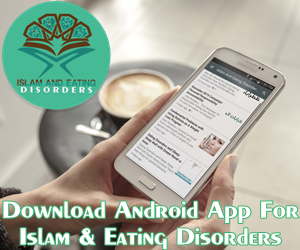 Eating Disorders are psychiatric illnesses affecting all societies, including Muslims. There are 70 million people affected by Eating Disorders worldwide. Members of the eating disorder community, including affected individuals and their families, professionals, researchers and policy makers, have united virtually to increase access to accurate information, eradicate myths and collectively advocate for resources and policy change. The first World Eating Disorders Action Day will take place on June 2, 2016 and generate information virtually in over 20 countries around the globe. Eating disorders, which are brain based psychological illnesses, affect up to 70 million people globally including people of all genders, ages, racial and ethnic identities, nationalities and documentation status, abilities, sizes, and socioeconomic backgrounds. Eating disorders have the highest mortality rate of any mental illness, yet many go untreated despite the fact that new research and methods are increasingly showing positive results for full recovery. On the heels of the release of the groundbreaking “Nine Truths About Eating Disorders” a global grassroots effort for a World Eating Disorder Action Day was launched to draw attention to these devastating, yet treatable disorders. Through virtual and country specific activism, World Eating Disorders Action Day will advance the understanding of eating disorders as treatable genetically-linked illnesses that affect a large cross-section of the world’s population, embraces diversity, and raises awareness amongst policy makers to allocate resources and establish coherent national systems. Furthermore, the Day offers new connections and global partnerships, grows the advocacy base and creates opportunities for additional actions for change at an international level. A Steering Committee comprising the Academy for Eating Disorders, Beating Eating Disorders, Elephant in the Room Foundation, Families Empowered and Supporting Treatment of Eating Disorders/F.E.A.S.T, International Eating Disorders Action, Nalgona Positivity Pride, National Association of Males with Eating Disorders, National Eating Disorders Association, Not All Black Girls Know How to Eat, ReGlamME and Trans Folx Fighting Eating Disorders will provide guidance and represent communities from over 20 countries across the globe. Eating Disorders are a harsh reality. The disease is still here affecting millions across the world. Please Do something on the Day.